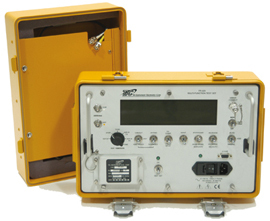 The TR-220 Avionics Test Equipment Set gives test ability for TCAS or Traffic and Collision Avoidance Systems, DME or Distance Measuring Equipment and Modes A, C, and S Transponders. The TR-220 test set has an advanced art design technology and its microprocessor control gives the benefits of having simple operation that would require only short amounts of training. Its setup menu permits storage of a range of test parameters to make fast recall of test conditions.